VATICAN CITY (CNS) — The first two married couples beatified as couples and St. Therese of Lisieux were being honored during the extraordinary Synod of Bishops on the Family. The relics of St. Therese, her parents Blessed Louis and Marie Zelie Guerin Martin, and Blessed Luigi and Maria Beltrame Quattrocchi, were to be in Rome’s Basilica of St. Mary Major for the duration of the synod Oct. 5-19. 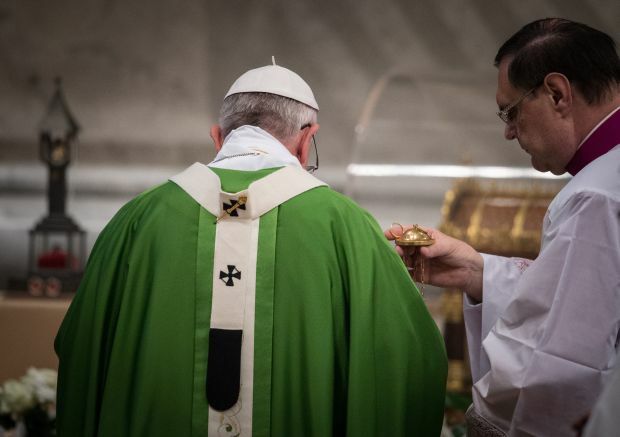 Before the synod’s opening Mass in St. Peter’s Basilica Oct. 5, Pope Francis venerated the relics, which were brought to St. Peter’s just for the Mass. Their presence and prominence underlined the importance of St. Therese and the blessed spouses for today’s families. Blessed Luigi and Maria Beltrame Quattrocchi became the first married couple to be beatified together; declaring them blessed 2001, St. John Paul II called them models of holiness for all Christian spouses. The husband was an Italian civil servant, a church activist and promoter of social welfare, who eventually became the country’s assistant attorney general. He died in 1951. When his wife was pregnant with their fourth child, doctors told her that she would die unless she aborted the baby. The couple decided they couldn’t do that; a daughter was born in 1914 and the mother lived another 51 years. All four children became priests or religious. Testifying to their parents’ holiness, as adults they said the couple seemed like ordinary parents at the time — they suffered through hardships and disease, argued a little, but mostly treated each other with a deep respect and love. Father Quattrocchi recalled that his parents never really fought, but they disagreed sometimes and would exchanged hard words. “They had their contrasts in ways of seeing things, but it was always about secondary things. Afterward, they would apologize to each other,” he said. She became known as St. Therese the Little Flower because she referred to herself as a little, not particularly important flower in God’s garden. Pope Francis has said he has a particular devotion to this French saint, who died of tuberculosis at the age of 24 in 1897. Her parents were beatified in 2008, making them the second married couple to be beatified as a couple. They were also the first parents of a saint to be beatified, highlighting the important role parents play in their children’s human and spiritual upbringing. The cardinal said the Martins were a “gift to parents,” widows and widowers, and those facing illness and death. Marie Zelie Guerin married Louis Martin, a watchmaker and jeweler, in 1858. She died of cancer in 1877, at the age of 46; Louis died when he was 71 in 1894. The couple had nine children, but four of them died in infancy. The five who survived all entered religious life. Even during the most difficult circumstances, the family is always the “seed bed” or “nursery of holiness,” he had said; the family is the place where people learn about God, about prayer and about self-giving in service to others.